If you want to share your data discoveries with the world outside of your organization, you can save your workbook to Tableau Public, a free cloud service. On Tableau Public, anyone can interact with your views, or download your workbooks or data sources. For information, go to the Tableau Public website. With your workbook open in Tableau Desktop, select Server > Tableau Public > Save to Tableau Public. Note: This option is available only if you’ve created a viz that contains at least one field. 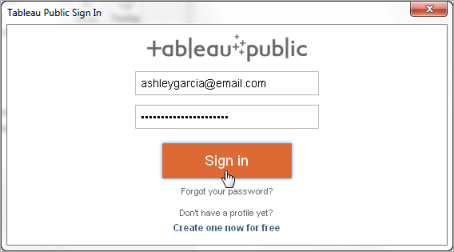 Sign in using your Tableau Public account. If you don’t have an account, select the link to create a new one. Type a name for the workbook and click Save. When you save a workbook to Tableau Public, the publishing process creates an extract of the data connection. After the workbook is published, you are redirected to your account on the Tableau Public website. Hover the pointer over a viz to get access to actions such as selecting it as your featured viz, or hiding, downloading, or deleting it. Hover the pointer over a viz and then select View to open the viz’s home page. There you can select Edit Details to customize metadata such as workbook name and description, add a permalink, and change other settings.